SANTANA can be chartered from one day to multiple days. We provide all the game gear required. Plus bottom fishing gear and bait. For your sleeping requirements all you need is a sleeping bag. For overseas clients other arrangements can be made. will start about 7am in the morning with a quick stop for live bait fishing in the harbour, then out the entrance and pass Stephenson Island. The skipper will then decide which way to go depending on weather conditions, water temperature, where the blue water is etc. The day will end around 6pm back at the weigh station. will start much the same, except after leaving the harbour the boat will head towards North Cape via the 505 and the Fingers. All the way up the coast there is safe anchorage for the night. North Cape provides good bottom fishing and a great puka spot. 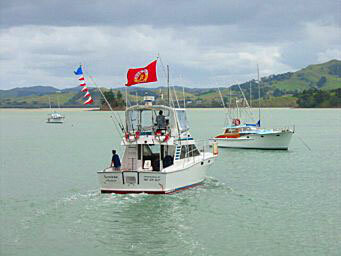 Got a marlin to weigh but don't want to go back to Whangaroa? We'll just go into Houhora and arrange for our Smokey to came and get it for you. is the ultimate. Five or more days where the fish are wild and much larger then on the coast. At the skipper's discretion which is weather dependent you could leave that night and travel all the way thru or stop at North Cape for the night, or leave in the morning. The days are long with the skipper possibly turning the boat over at approximately 4am, he will leave you in bed but bring him a coffee when you get up. Your days will be spent out on the Banks trolling for marlin or bottom fish. The trevally are huge up here. Anchorage can be found at the islands or if the weather is fine, drift at night. On Santana we like to give our clients a hands on experience. That means we plan to involve you in all aspects of gamefishing from angling to tagging a marlin, steering the chair, clearing the gear and the rest. You have the choice of providing your own food allowing for two crew or we can provide at a cost of NZ$50 per person per day. For clients flying in we can supply all the bed linen and arrange to have your alcohol onboard chilled down for you.